While she is in Soul Cairn, she can be asked to turn 5 Soul Husks into a Soul Husk Extract. 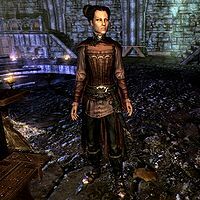 She no longer offers this option after relocating to her study in Castle Volkihar. Valerica wears a set of vampire royal armor with a pair of vampire boots. She is equipped with a ring of regeneration, a necklace of frost suppression, and an ebony dagger. Esta página foi modificada pela última vez à(s) 19h24min de 15 de agosto de 2014.